The department submits book purchase request to the University’s library. Students can borrow books via internet or in person. The departmental library collects teaching DVD and undergraduate thesis that students can borrow. All classrooms are air-conditioned equipped with additional fans. Computer, projectors, microphones, and amplifiers are available in every classroom. Screens are also integrated into one control station. Wireless online service is available throughout the campus. In addition, the department has computerized classrooms, audio-visual classrooms, and multi-media classrooms. I. Electronic enterprise lab, with the objective of promoting education in E-business, construct e-business teaching environment, promoting the e-business education program, and help students attain relevant professional certificates. II. Entrepreneur and placement lab, equipped with lattices to display commodities, computer systems, and POS system to handle transactions. III. Logistics lab, equipped with logistics models and picking systems used for classes related to logistics management. 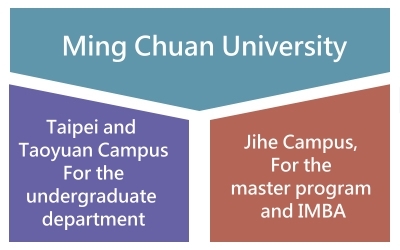 Student activity space includes two meeting rooms, panel discussion room, local Taiwanese master student research lab, IMBA student research lab, doctoral student research lab, and EMBA student research lab. This department has eight e-classrooms, three laboratories, one case study classroom for the use of students and faculty members. The university offers teaching software for general purposes, such as statistical packages and antivirus soft wares. This platform provides a venue of interactive digital learning for the students and faculty. Teachers can interact with students via the Moodle platform to display learning material, allow students to submit homework, provide real time Q&A, and save teaching materials. 1. Internet hard-disk on cloud: students can log on to the Moodle platform, which contains learning materials. Such arrangement enhances students’ learning performance. 2. Multiple teaching soft wares, including Adobe, Visual Studio, SPSS, Office, TQC and it audio-visual version. 3. Classroom on cloud offers Adobe, CS5, ERP, Eview, JAVA, and SAS, five on-line labs.